You’ve found a lawyer to handle your Arkansas personal injury case – someone with a solid reputation, integrity, compassion, and skill. You’ve signed the fee agreement. What happens next? If the firm you’ve hired is Taylor King Law (great choice, by the way! ), your attorney and case manager will keep you informed every step of the way. If you’re still on the fence, we’re happy to answer a few of your questions. Here’s what you can expect when you begin a personal injury claim in Arkansas. First things first: What is the process of filing a claim? One of the most common misconceptions about personal injury claims is that once you hire an attorney, they can immediately begin negotiating your settlement with the insurance company. Unfortunately, it’s not quite that simple. The process of settling a personal injury claim is just that: a process. 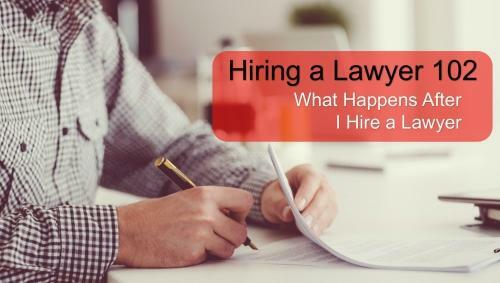 What can you expect from your lawyer after you hire them? 1. Gathering information is a vital first step. Your attorney and case manager will track down police reports, ask for any photos you took at the scene, and may begin gathering witness statements, if necessary. These pieces of the puzzle will help establish fault in the accident. 2. This comes as a surprise to most clients, but your attorney will wait to make any settlement demands until you are released by your doctor. He or she cannot proceed with the case until you’ve finished treating, or until your condition has stabilized if long-term treatment will be involved. Why? If your attorney began negotiations while you were still treating for injuries, you might not fully recover your medical costs. This practice protects you as the client. 3. Once you’ve been released from treatment, the law firm will begin gathering other documents and records: lost wage forms and medical reports, records, and bills. This part takes time. Your attorney or case manager will make the request, wait the allotted amount of time to receive a reply, and then often must follow up multiple times before the records are received. 4. Once all records and bills have been received, your attorney will compile this into one packet and will send it, along with the settlement demand, to the insurance company. You will be notified when the demand is made. After that, the ball is in the insurance adjuster’s court, and you’ll wait for your attorney to receive their settlement offer. 5. Your attorney will keep you informed of every settlement offer you receive. He or she will discuss each with you and recommend whether you should accept or reject the offer. Ultimately, the decision is yours. Generally, the negotiation phase will require several offers and counteroffers from your attorney before reaching a fair settlement. 6. If, after negotiating, you are unable to reach a fair settlement agreement, your attorney will discuss the option of filing a lawsuit. Do you have a solid case, likely to receive a favorable ruling from a judge? Will the court fees and time invested be worth the possible settlement? Your attorney will be able to give you an honest opinion based on years of experience. So hiring a lawyer does not automatically result in going to court? No! Your lawyer generally won’t pursue this option until negotiations have been exhausted. Though every case is different, the majority of clients settle out-of-court. However, there are times when the insurance company refuses to give an offer that will compensate you for your injuries, medical bills, lost wages, and suffering. In these situations, reaching a fair settlement may require filing a lawsuit. Taylor King Law: An Arkansas Injury Lawyer who’s On Your Side, By Your Side: Were you injured in an Arkansas car wreck where the other drive was at fault? You may have legal rights to compensation. An experienced lawyer can help not only to ensure that you’re fairly compensated, but also relieve the burden of dealing with insurance companies and adjusters. The attorneys at Taylor King Law have a proven track record of helping Arkansans get the settlements they deserve. To begin your FREE consultation, you can call at 1-800-CAR-WRECK (227-9732), submit a form online at www.taylorkinglaw.com, or download the free Taylor King Law app for iPhone and Android. Don’t wait to get help – hire a lawyer who will be on your side, by your side!